A creamy energizing Citrus Mint Soap. 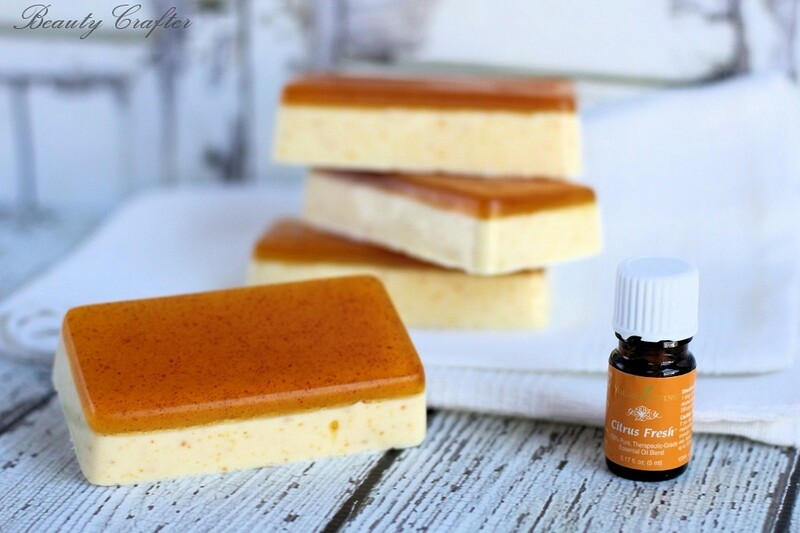 Easy melt and pour recipe to make your own creamy refreshing homemade soaps. 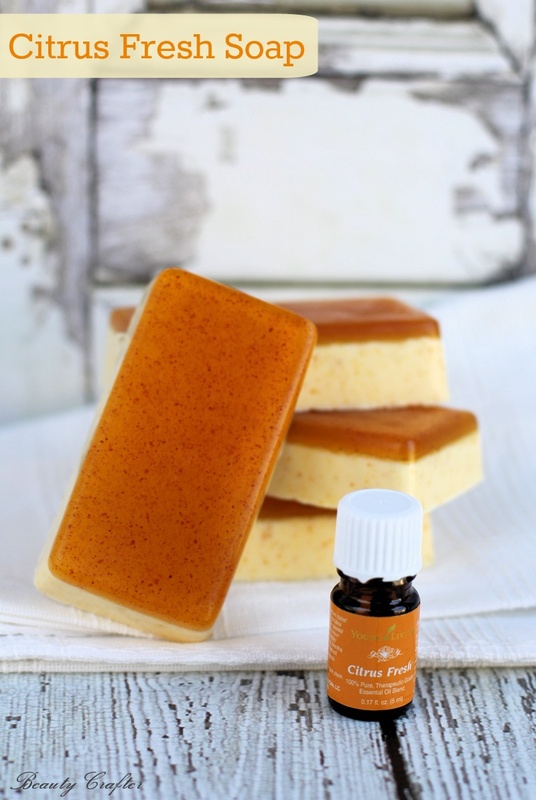 This Citrus Mint Soap recipe features Young Living’s Citrus Fresh essential oil blend (directions are included to make this without this particular blend, for those using other brands). This energizing blend of citrus fruits and spearmint essential oils is geared to be used as a dietary supplement, but why miss out on the divine smell & shower time pick-me up. The recipe has two distinct soap layers, one glycerin layer, and one of creamy goat’s milk soap. If you have a preference to just use one, simply adjust the recipe accordingly. Texture and natural color is derived from finely ground dry clementine peels. This citrus and spearmint soap is easy to make, either with the Citrus fresh blend or a simplified version made from a simple combination of orange & spearmint essential oils. Try pairing this soap with my Orange Mint Sugar Scrub. Orange Mint Soap recipe made with melt and pour soap and essential oils. A great beginner soap making project with attractive finished look. Cut the pour and melt soaps into small pieces (approximately 1/2″ square, but don’t be fussy about it). Keep the two types of soap base separate. Place the glycerine soap in a microwave safe mixing bowl and zap for 30 seconds. Stir and repeat in 15-20 second intervals until soap is melted. Add 1 tsp of clementine dust and 15 drops of Citrus Fresh essential oil (10 orange & 5 spearmint) to the glycerine soap and mix well. Pour carefully into the molds, dividing evenly. 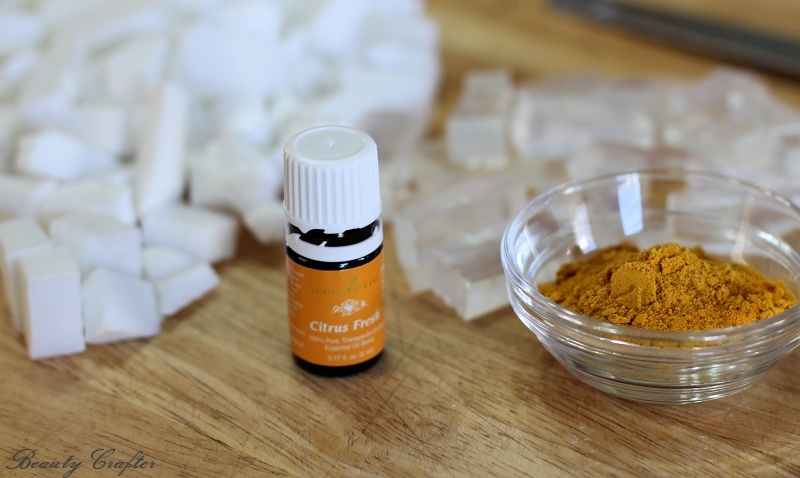 Melt the goat’s milk soap base, in the same method as above, then add 1 tsp of clementine dust and 45 drops of Citrus Fresh essential oil (35 orange & 10 spearmint). Mix well, then top off the molds with it. Set the soap bars aside to cool. Once cool pop out of the molds by pressing against the back until the soap releases. Soap is ready to use or gift. *I used a tray mold of 4 (4oz) bars. Note of caution: Do not exceed the essential oil quantity in this recipe, as too much of some citrus fruit essential oils could be reactive in sunlight. If you are using the orange and spearmint version this is not a concern. Orange oil is not phototoxic. Am I reading that right? This makes 4 bars? And takes almost an entire bottle of citrus fresh? Just checking. It takes about 60% of the 5 ml sampler bottle. I know that seems like a lot, but these are full sized bars, each of which is used multiple times. That is a lot of showers. Citrus Fresh is actually one of the least expensive blends, so if you end up picking up a standard 15 ml bottle later, you will find it isn’t so bad cost wise.